A few months ago while leaving my doctor's office, I saw a bunch of people holding picket signs protesting in front of a Planned Parenthood clinic. Usually, religious zealots come out of their faces with this sort of topic and start bible thumping those who have had abortions. It's their version of "tough love" - to show people that killing unborn babies is wrong - to show people that God is judging them. 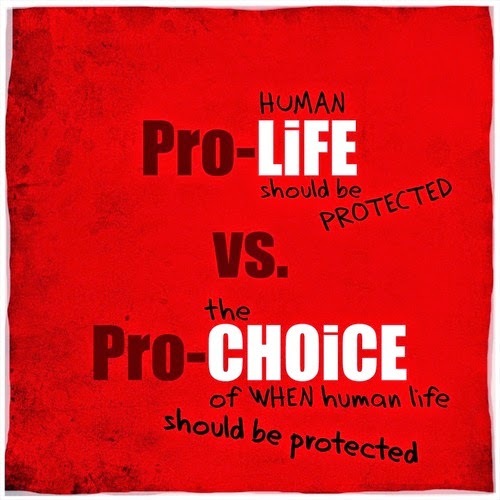 But the thing they seem to forget about is: God gave people "choice". God gave people the ability to choose what they want to do with anything in life. So who are we to judge? Now, at the same time, I had an inner smile while looking at these folks - people who were standing up for the potential of a newborn baby who doesn't have a choice to make; only the mother does. 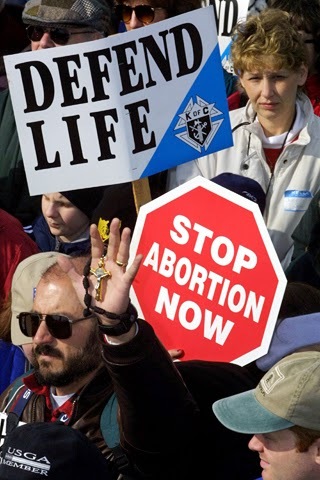 I guess I have mixed feelings with these protesters because on one hand, yes I agree that no life should be terminated, but no I don't agree we should be the judge for those who choose to do this. Now, the gray area stands: is this considered "murder"? My parents had 3 kids all close in age. After 7 long years and finally, almost a break to have their young life back again, the doctor approached my mother and told her, "Do you know you are pregnant?" I'm sure this was a pretty tough decision to make for the both of them. They just got through the toughest childhood years - why would they want to go backwards again? But they chose to give me a chance. They chose to let me live. The birth wasn't easy either. I was a breech baby. But let me just backtrack a little. There was a terrible snowstorm on February 3rd, 1974. My parents were both having dinner over at a family friend's house. Back then, if you had a drink or smoked a cigarette - it wasn't a big deal as it is today. Nobody really knew for sure if it would affect an unborn baby. So, she sipped on her martini not expecting me to arrive that particular night. While they were home trying to go to sleep, mom felt something strange: my foot. I was testing the waters so to speak, trying to get out and enjoy my new life. Back in the day I was kinda' cute, huh? "Charlie? I think it's time," she said, not telling him about the foot that was outside of her body. She didn't want my dad to panic. They both flew up to the hospital in the snowstorm a little before midnight. The roads were messy so it took a little time, but my foot was making it's way out entirely. As they arrived at the hospital, they discovered that her doctor along with many others were on vacation. They had to substitute doctors that night. 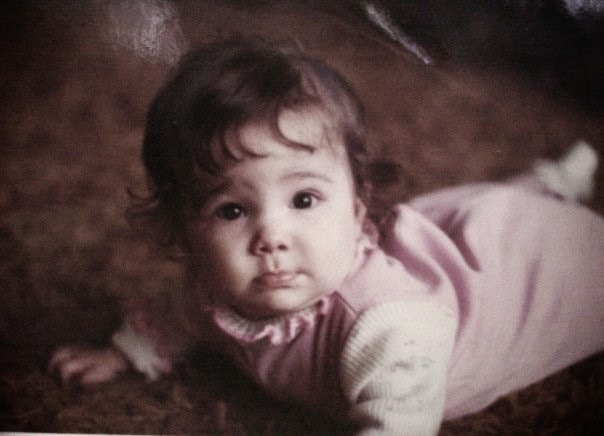 It should have been a c-section, but instead, they cut my mother in a way that would allow the doctors to go inside and twist me around so that my head would come out first. It was such a grueling birthing that one of the doctors passed out on the floor. Another had to take his place. Long story even longer - I was alive and well. We were not supposed to make it out alive the surgeon stated. "You two were not supposed to live." And we did. It was a miracle. So, I thank my mom so much for having me, and for enduring all the pain she went through. She chose to have me and chose to keep me. Back when I was 19 years old and very confused about who I was, who I wanted to date and what I wanted to do with my life in general - I found myself in quite the predicament myself. I had just broken it off with my boyfriend - a man - someone who was more like a best friend to me, because I knew in my heart I wasn't straight. So, I let him go. I was starting to date Madelene at the time. But the thing was, I didn't get my period for over 2 months. I thought it was probably due to stress since I went through a breakup. But still, I went to the store and picked up a pregnancy test. I went the next day to buy another. I went to the doctor to get a urine sample. I pictured my life growing up way too fast. I panicked. So at work, during lunch, I sat down with my ex-boyfriend to tell him, thinking he was going to freak out and say, "You're going to abort it, right?" But instead, he said, "I'll take care of the both of you! We can get married and raise the child together! This is wonderful!" He held both my hands across the table, but that wasn't what I wanted. I didn't want to start a life with him just because we had a child together. I wanted to raise the child on my own to the best of my ability. I promised him that he would be able to see the baby any given time. Then, I told Madelene. I was sure she was going to put her hands up and say, "Whoa - yeah - I can't do that." Instead, she said, "Really? Really?" With a huge smile wrapped around her face. "Do you still want me in your life? Because I can help you raise the baby and we can both be terrific parents." My jaw dropped to the floor thinking - "Who is this woman?" She was willing to take on the role of a mother at such an early age, just to be with me and have a family. I was so touched by this. About 2 months in, I hemorrhaged in my bathroom not knowing why I was bleeding so much. I had a miscarriage that sent me to the hospital. I didn't tell a soul about it - in fact, nobody knew I was pregnant because I wanted to tell everyone around the 3rd or 4th month. At 19 years old, I don't think I ever cried so hard as I did that day, knowing for sure what had just occurred. I always envisioned taking care of my baby and giving him or her a wonderful life. I didn't care if I got yelled at for being pregnant or whatever 'consequences' may lie ahead - I wanted this baby more than…life. And it almost took my life because I had nothing else to live for. The only people who know about this story is my mother and my wife. Should Transgender People Educate Society?